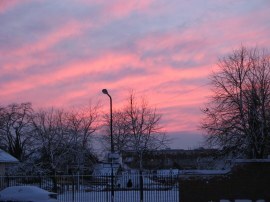 I did this walk on Sunday 19th December 2010. There had been quite a heavy snowfall the previous day, photo 1, and it was too snowy to get the car out, however I suddenly realised I could still walk the final section of the Harcamlow Way as planned by taking the train to Ware and walking back to my start point at Cold Christmas from there rather than doing it as part of circular walk from Wareside which had been my original plan. There was a bit of delay on the Victoria Line but having left in plenty of time I was able to take my intended train from Tottenham Hale to Broxbourne where I only had a few minutes wait for the Ware service. As I was coming back from Roydon, which is on a different branch of the railway line to London, I brought a single ticket which cost a rather steep £7.60, (although I did find £2.30 change in the ticket machine)! Leaving Ware station I headed to the right along Amwell End, crossing over the River Lea, before heading up New Road. There was then a steady climb up the road and along Musley Hill out of Ware. Reaching the end of road I crossed over Fanhams Hall Road and joined a bridleway that was sign posted Cold Christmas 2 miles. 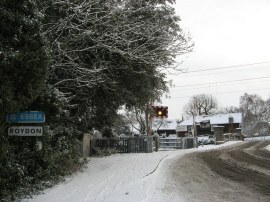 This heads out past a house to join a track running along the edge of a field, photo 3. 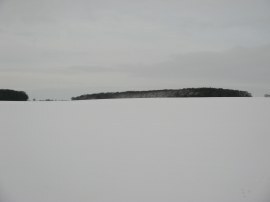 There was only about two or three inches of snow on the ground but it was very fine and powdery and in places there were much deeper accumulations which slowed my walking down considerably. With the snow, I was able to spot a number of hares out in the middle of the fields, almost always running around in pairs. 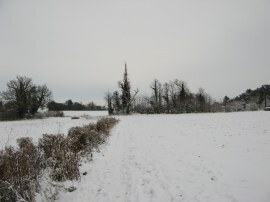 The bridleway runs between a number of fields and alongside a slightly broader band of trees on the left before heading half right across the middle of a field. At the end of this field the route joins a path between two more fields which leads slightly uphill to the point where I had finished the last stage of my walk along the Harcamlow Way a few weeks earlier, little guessing it would be another snowy day when I returned. At this point I had walked 2.21 miles from Ware station. Turning to my right I continued ahead across a short section of field before joining a hedge line by a small pond which I followed, heading every so gently downhill to reach a road. The route continues ahead over the road and across the middle of the next field, photo 6, passing a small overgrown pond, before heading over a drainage ditch from where the path heads to the right across a corner of a field towards a gap in the hedge. The route then continues ahead alongside the drainage ditch, marked rather more grandly as the Fanhams Tributaries on the map, across the bottom of two small fields to reach a small wooden footbridge. Here the route heads to the left along the edge of the field with a ditch on the right. At the end of the field the route heads to the right along a track, photo 7, that runs up to some farm buildings at Newhole Farm where a man commented that I was dressed up properly for the weather and then started grumbling about how unprepared everyone seemed for the conditions. From the farm the route then bends to the left along a byway that runs along the bottom edge of a field. This is followed down to the B1004 road where the Harcamlow Way continues ahead, heading downhill past some farm buildings and houses towards the River Ash, photo 8. 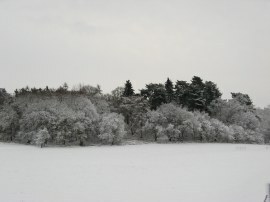 Ahead of me the branches of the trees of Easneye Wood where covered with snow, photo 9. Just before the river is reached the route turns to the left along the course of an old railway, photo 10, where I once again linked up with the route of the Hertfordshire Way for a short distance. 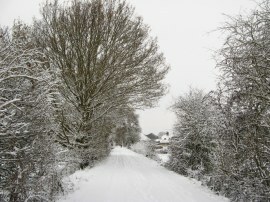 As with the previous stage, this was part of the old railway that ran between St Margarets and Buntingford. The line was opened in 1863 and closed just over 100 years later in 1964. 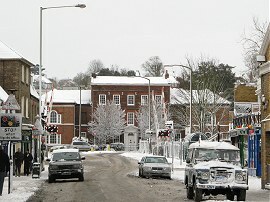 The route crosses over the river Ash and reaching a red brick house on the right heads to the right, uphill along a farm track. 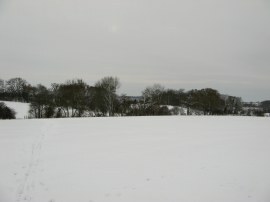 This track heads up to a field side path with a patch of woodland to the left, photo 11. Reaching the end of the trees the route heads to the left, following the edge of the woods. 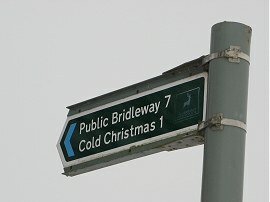 The bridleway then follows a fairly straight course, running between fields with a hedge to the left. 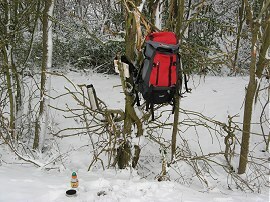 For a while the path runs alongside the edge of the trees of Moat Wood which as well as providing some shelter from the breeze also had a handy place to hang my things while I stopped for a tea break, photo 12, in fact I could almost do with a decent storage unit like that at home. Looking across the fields I could see numerous animal tracks coming and going. After my break I continued along the field to reach a small pond. Here there is a wooden bench and the route heads to the left through the hedge besides this and then heads diagonally across the next field. Reaching the far corner of this field the route then turns sharp right to head back across the field. As I was heading back across the field I saw a fox running through the trees of the woodland to my left. That was the official route of the footpath as marked on the map although when I left the field I noticed there was a permissive path signed up along the field edge back to the point where I had first entered the field which would prevent the heading back and forth over the field. Continuing ahead into the next field the Harcamlow Way passes by the remains of a small wooden barn with a small patch of tree to the left. Away to my right I could see the trees of Moat Wood that I had been walking alongside earlier, photo 13. Reaching the end of the trees on the left the route continues ahead along the right hand side of a hedge for a short distance before heading into the field on the left. 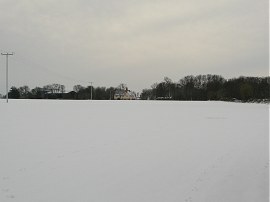 The Harcamlow Way then across the corner of the field towards a large house that can be seen in the distance in photo 14 and I noticed that for the first time today I was walking along a path that no one else had walked on since it had snowed. The footpath leaves the field and heads just to the right of the house before continuing ahead across the garden towards another house where the Harcamlow Way turns to the left along a driveway. This driveway runs between farm buildings to reach the Hunsdon Road. Once again the route continues straight across the road to join a field edge path that continues ahead with some electricity pylons visible ahead in the distance. The route passes alongside a small band of trees and at the end of these turns left along a track, following the edge of the woods. Ahead I could see the tower blocks of Harlow as well as hear the steadily increasing noise of the traffic from the nearby A414. Reaching the end of the trees the route continues ahead for a short distance between fields before turning to the right, following the line of a hedge. 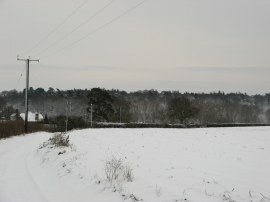 The route follows this field edge path as it curves round to the left, passing under the electricity pylons down to reach the A414. 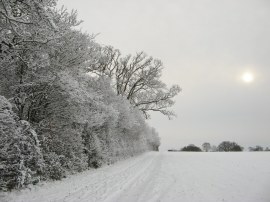 The snow was particularly thick on this stretch of path having been caught in the shelter of the hedge and with every footstep my feet were sinking through the fine powdery snow which made me rather regret not wearing my gaiters. The route takes an underpass under the A414 and then, following the route as marked on my map, I continued ahead across a small section of field before turning to the left along a broad snow covered track. 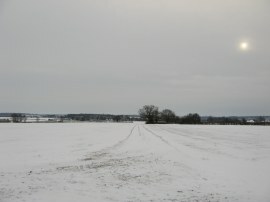 I had a feeling that the route may have been re-routed here as there was no path across the small field that I could see despite the remain of a crop being visible above the snow, whilst there was a track running off to the left alongside the main road. Sure enough my suspicion was confirmed when about 100 yards down the track there was a footpath clearly marked heading towards the A414 from the track I was already on. I was now getting near to the end of the walk and a short distance further on the route joins a fenced footpath on the right sign posted Roydon ¾ mile. 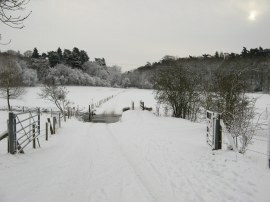 This path heads down past a pond and alongside the edge of another long frozen pond, photo 15, the tranquil scene being disturbed by a very noisy dog barking away. Heading alongside the pond the route crosses over the bottom of a garden belonging to the noisy dog before joining a fence lined footpath running along the edge of a field. Reaching the end of the wooden fence the route heads through a gate on the right before continuing on down the edge of the next field with a metal fence on the left. 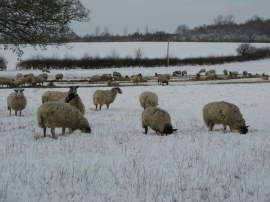 This field was being grazed by a number of sheep, photo 16, who looked well insulated against the cold weather. At the end of this field I turned to the left along the B181 Roydon Road and a few yards down the road I reached Roydon Station which marked the end point of not just this stage, but of my entire walk around the Harcamlow Way. Reaching Roydon station I had walked 8.62 miles which meant I had walked a further 6.41 miles along the Harcamlow Way for the day. As I was approaching the station the train barriers came down as the one train in the hour approached the station. It had been my original intention to take the train from Roydon back to London but by this time I had already decided to walk on to Rye House to make a slightly longer walk, and I had thought I would have missed the train anyway except that it was running a good ten minutes late. Once the train had left I crossed the railway and took a photo looking up the River Stort, looking along the path I had set off from back on a very rainy October day in 2009, photo 18. 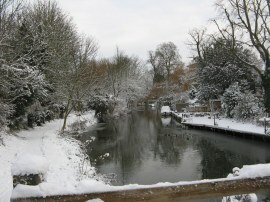 I then turned around and began heading back along a very familiar stretch of path alongside the River Stort towards the River Lea. 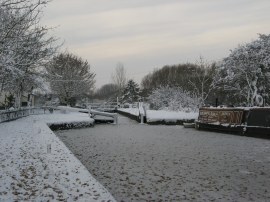 Much of the river was frozen and I passed by a very icy Brick Lock, photo 19. Ahead of me I could see the towers of the power station near Broxbourne which indicated how close I was now getting to the river Lea. soon I was passing the final lock of the River Stort Navigation, the Roydon Lower Lock and heading on to reach the junction of the Rivers Stort and Lea. 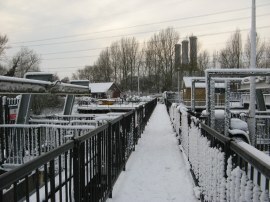 The path heads over the large and complicated flood control structure of Feildes Weir, photo 20, before heading round past the lock keepers cottage and Feildes Weir Lock to cross over the River Lea. Here I turned to my right and started heading up the River Lea Navigation towards Rye House. Reaching Rye House Station I had walked 10.7 miles in total. I finished off my tea and sandwiches while waiting for the train back to London which to ok me to Seven Sisters where I got the tube back to Walthamstow, photo 21.This had been a very easy walk and I don't think there was a single stretch of road walking on this stage. 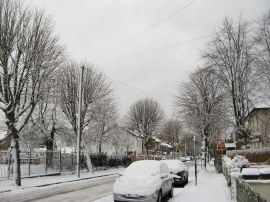 Despite the snow it was far warmer than when I had walked the previous stage in the bitterly cold North East wind. So, after 15 months I finally completed my walk around the Harcamlow Way. That is rather a long time for a 140 mile path, the GPS actually made the length of the route 141.95 miles, although with all the circular walks I have walked almost double this distance, (272.1 miles), while doing the Harcamlow Way and have also managed to complete a number of other recreational trails with my friends in the meantime. 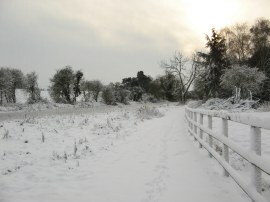 I have uploaded the route of the walk which can be accessed here Harcamlow Way 17 Route.